An acid-mediated annulation reaction for the formation of 7a-substituted unnatural pyrrolizidines is described. To reach this goal, the pyrroline 3-(3,4-dihydro-2H-pyrrol-5-yl)propan-1-ol is reacted with a large variety of isonitriles directly resulting in the target compounds. 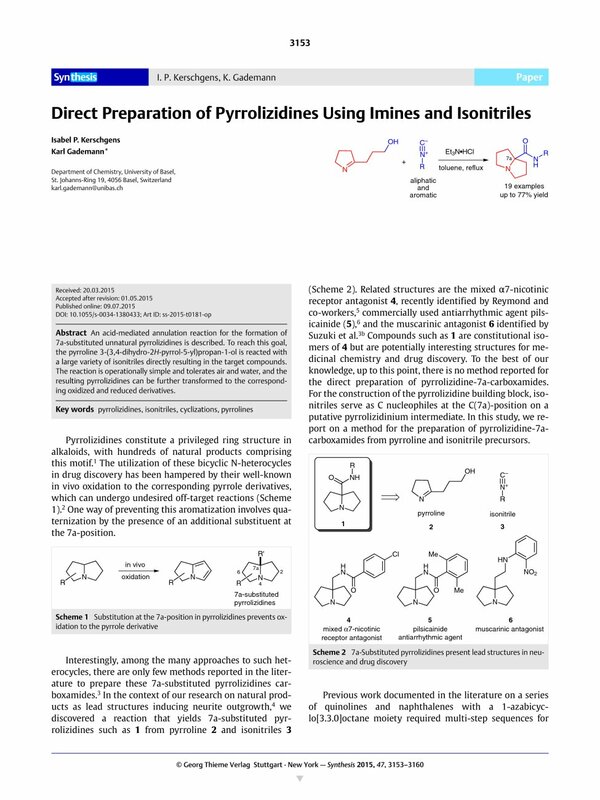 The reaction is operationally simple and tolerates air and water, and the resulting pyrrolizidines can be further transformed to the corresponding oxidized and reduced derivatives. Supporting information for this article is available online at http://dx.doi.org/10.1055/s-0034-1380433. 10 Ethylene oxide was used as a solution in THF. 12 No product formation was observed with strong electron-withdrawing groups such as NO2 and CF3.